Rio Grande Valley FC Toros' defender Robert Castellanos (4) and LA Galaxy II's midfielder Efrain Alvarez (26) battle for the ball during a United Soccer League season game at H-E-B Park on Wednesday, May 23, 2018 in Rio Grande City. 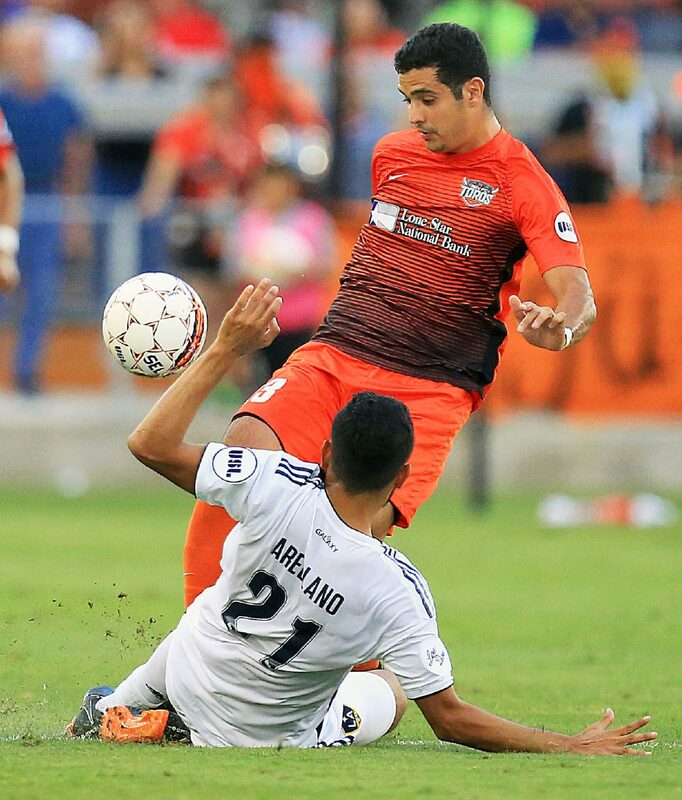 EDINBURG — RGV FC Toros defender Kai Greene called it an innocent ball that turned dangerous. 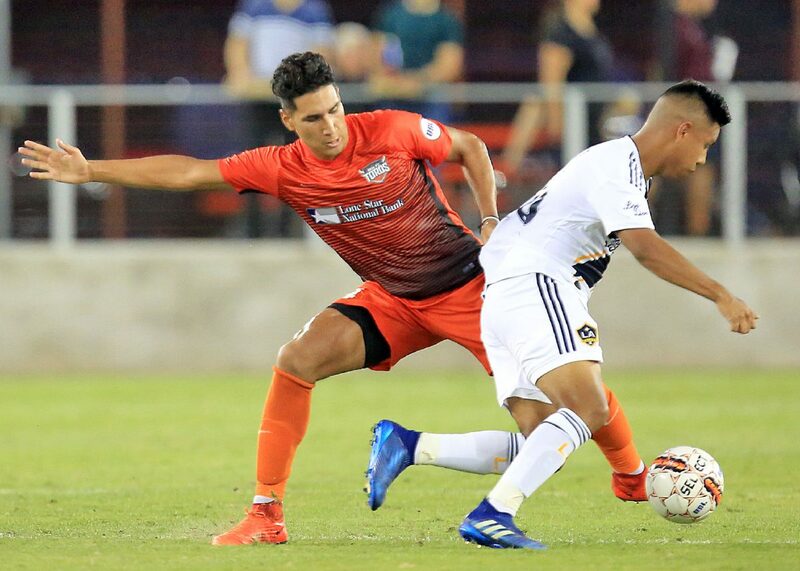 With the Toros holding a one-goal advantage in the 87th minute, LA Galaxy II defender Jean Engola played a long ball forward into RGV’s half. Toros keeper Nico Corti charged forward but reached the ball just a fraction of a second after LA’s Frank Lopez made his first touch near the top of the penalty box. After chasing down the ball near the right edge of the box and only about 6 yards away from the byline, Lopez tucked a high shot just inside the far post, leveling the match. 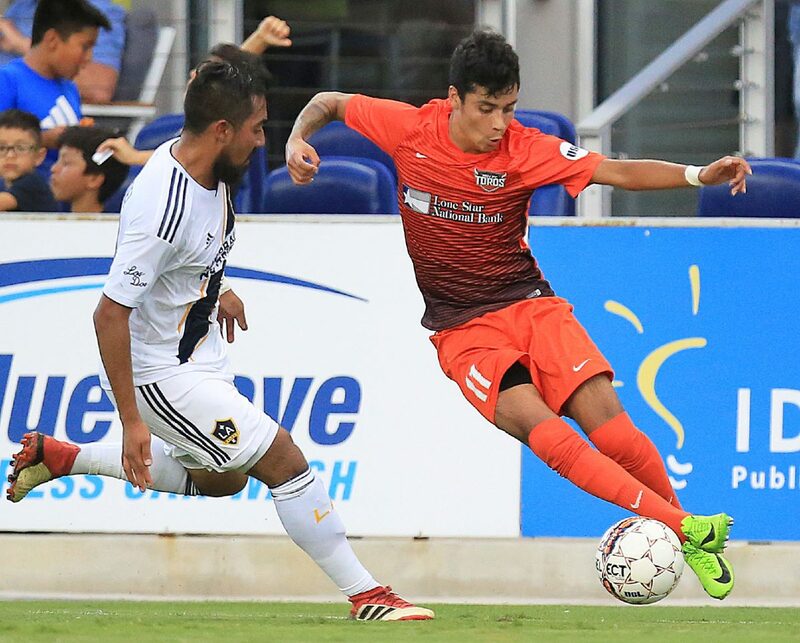 The equalizer was the final tally as RGV and LA played to a 1-1 draw on Wednesday at H-E-B Park, marking the Toros’ fifth consecutive draw and the fifth time in 11 matches this season that RGV has let a second-half lead slip away. Rio Grande Valley FC Toros's midfielder Nicolás Perea (8), right, and LA Galaxy II's midfielder Julian Büscher (18) collide as the head the ball during a United Soccer League season game at H-E-B Park on Wednesday, May 23, 2018 in Rio Grande City. 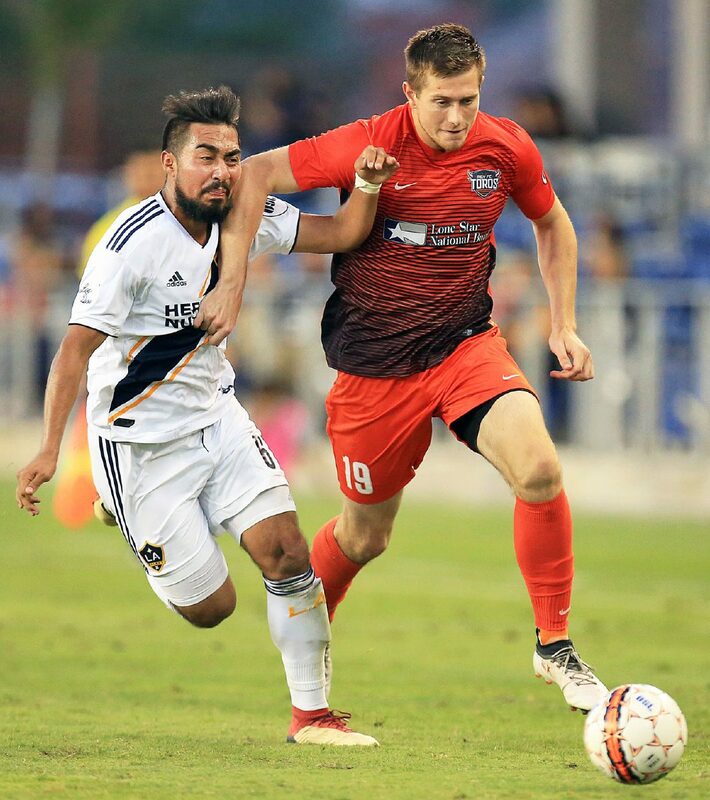 Rio Grande Valley FC Toros' forward Mac Steeves (19) and LA Galaxy II's midfielder Jonathan Hernandez (67) battle for position behind the ball during a United Soccer League season game at H-E-B Park on Wednesday, May 23, 2018 in Rio Grande City. RGV FC moves to 1-3-7 overall, including a mark of 1-0-6 at home. The Toros have gone six straight matches without a loss, but the past five have been draws. With 10 points on the season, RGV ranks 13th in the Western Conference standings. 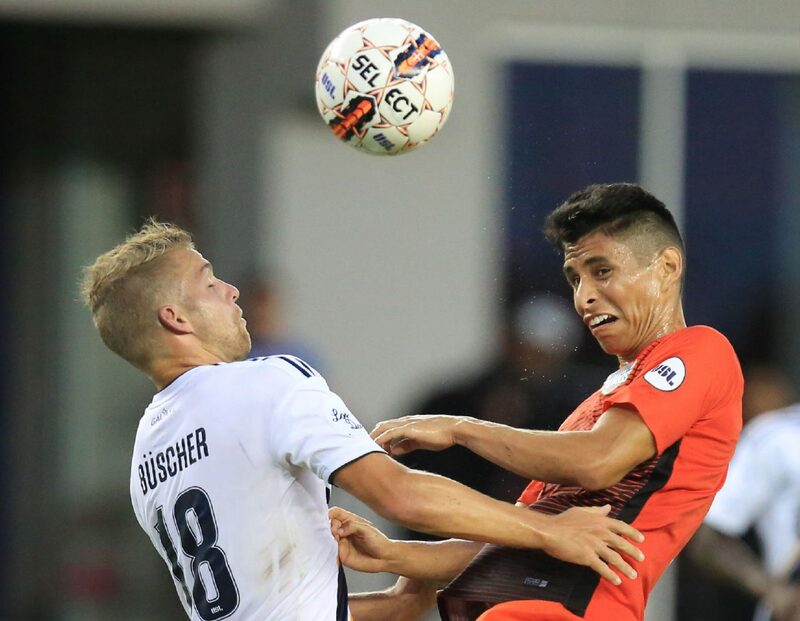 As has been the case after most of the team’s recent matches, Echeverry said he felt RGV FC outplayed LA on Wednesday. The Toros held minor edges in possession (50.9 percent), total shots (12-9) and shots on target (2-1). Greene said he felt the Toros “dominated” defensively against a Galaxy side that had scored 12 goals in its past three matches. LA’s lone shot on target proved to be enough to equalize. Echeverry said he would have to review video of the play to determine the precise breakdown, but he speculated that either Engola should have been challenged higher up the field, the central defenders should have cut out the pass, or Corti should have been less aggressive in his charge. The goal answered RGV FC’s initial tally, off the foot of Aldo Quintanilla in the 14th minute. About 25 yards from goal in the middle of the pitch, Quintanilla played an awkward shot that LA’s keeper was unable to handle on a short hop. The goal was Quintanilla’s team-leading fourth of the season and snapped a streak of 285 minutes without a goal for either side at H-E-B Park, which had hosted three consecutive scoreless draws entering Wednesday. Still, Quintanilla’s strike was not enough to snap the skid of lackluster outcomes. Entering a long break before the team’s next match on June 4, Echeverry said he was “not going to hit the panic button.” The time off will give RGV’s young players a chance to recharge, Echeverry said. Greene said the layoff will be a time for reflection.